The archbishop of Kirkuk slams the use of religion for "political purposes" and the danger of sectarian division of the country. Ten years after the fall of Saddam, the situation is worse and people are "disheartened". He calls on the Church and the next patriarch to be sources of unity, dialogue and a guarantee for the Christian presence in the Middle East. Rome (AsiaNews) - In Iraq, religion plays an essential role but is used for "political purposes". Following the fall of Saddam Hussein's regime, a "sectarian mindset" has set in, pushing communal identity over national unity, this according to Mgr Louis Sako, who spoke to AsiaNews in a long interview about the recent history of Iraq, the Middle East and his country's Christians. Almost ten years have passed since the country was invaded (March 2003) and its old strongman overthrown. Sadly, democracy, equal rights and freedom are "dreams" and people are "disheartened", said the archbishop of Kirkuk, in northern Iraq, a key battleground between the central government and Kurdish separatists over oil. The Christian community has been touched by violence in recent days. On Monday, a Christian woman was killed during a robbery, her throat cut. The next day, a car bomb killed a Christian medical student on his last year of studies. Both events are connected to the country's tense situation, with Sunnis and Shias divided by religion and Arabs, Kurds and Turkmen vying for power. For Muslim intellectuals and Christians, this is an "Arab winter," the prelate said. A new patriarch (to be elected in late January in Rome) will be a key figure, "father and pastor," Mgr Sako said, with important tasks to fulfil and reforms to implement. 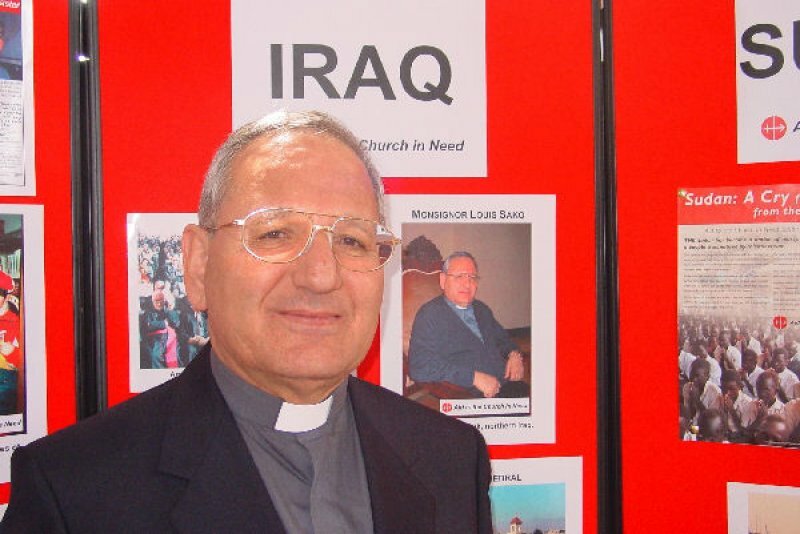 Your Excellency, two Christians were recently killed in Mosul. The current situation reminds us of the dark period in 2004-2006. How are things now? Iraq is home to various ethnic, religious and linguistic groups: Arabs, Kurds, Turkmen, Christians, Sunni and Shia Muslims. This has been a constant headache for Iraqi leaders who appear powerless to solve the country's problems. After various referendums and elections, handing out positions has led to bickering among them. Protests, demonstrations and rallies are up. Threats and violence have created an institutional vacuum filled by criminal groups and extremists and this has made matters worse. At present, no solution appears to be at hand. In fact, political and ethnic divisions seem to be getting worse. Sunni Arabs accuse Shias and Kurds of violating their rights. Turkmen appear marginalised by everyone. Christians feel persecuted. Ten years since Saddam Hussein's fall, the country seems worse off, even for Christians. Will things get better? The current government has spent the past ten months trying to get its act together, and had not yet done it. The cabinet wants to do something, but others do not want to help it. A tribal mindset prevails in which everyone wants to be the chief (sheikh). A power struggle is taking place, without any clear goal. Change must come through dialogue and talks, not violence and disorder. Religion here plays a crucial role and is used for political reasons. Secular political leaders go to the mosque, wear the traditional dress and recite the verses of the Qur'an. Laws, institutions and the constitution are seen in different ways and are a source of conflict. After the fall of Saddam Hussein's regime, sectarianism and confessional divisions drove Shias, Sunnis, Christians, Arabs, Kurds and Turkmen apart. One's identity was more important than that of the nation. Brother was against brother. Our fear is that the country might be divided into enclaves. President Jalal Talabani's illness and the influence of other countries in the region are making matters worse. Each group wants to impose its own agenda without taking into account the interests of others. In the countries of the Arab spring, democracy and freedom appear like a dream that will take a long time to realise. We are really disheartened! How are rulers responding to the people? Given the situation, ordinary Iraqis and leaders are disheartened. Starting on the path of reconciliation, of exchange towards forgiveness, is not possible. The mindset that pushes towards vengeance is stronger than the law and legalities. Political and community leaders have no overall plan for the country's development. Regional conflicts, power struggles and a strong political Islam mean that open and pluralistic political life, in which everyone is truly equal, is improbable. Meanwhile the danger of Iraq's division grows. As one of the country's "glue", what role can Christians play? Partition remains a strong possibility, one that is getting stronger given the situation in Syria and Egypt. Independent political leaders do not exist. Religious and ethnic parties pursue their own interests and autonomy. The situation has been complicated by the militias. Christians are dwindling in numbers as the exodus continues for various reasons. The Church does nothing and Christian political parties have failed in helping Christians remain, despite the possibility of making their voice heard, influence and build bridges with the other components of the nation because of their high educational levels. Neither the Church nor Christian politicians have a real vision, a clear and detailed plan or concrete answers. Increasingly, Christians are dejected as is the rest of the population. We are disheartened! Religious freedom is not equally protected. There is a state religion in Iraq and around the region; the others are "tolerated" in the worst sense of the term. Oil, a valuable good, causes conflict rather being a collective good . . .
Iraq is not only rich in oil but also in water, land, and could attract tourists. Under the old regime, money went to buy weapons. Now the nation is poor and the public good is not respected. People are tired and a general malaise has enfeebled the nation. Where is Iraq in the Mideast context? What is left of the Arab spring? The US and Western plans for the Middle East explain the situation, I think. The goal of these plans is to divide us along ethnic and religious lines. And the countries of the region are driving this project in accordance with their own specific interests. In Syria, where it is a question of life and death, the conflict is between Sunnis and Alawis. Sadly, the West is making matters worse rather than helping. By backing the opposition, it is preventing a political solution involving all the parties to the conflict. Christians and Muslim intellectuals are in an "Arab winter", not the much vaunted spring! Your Excellency, how is the Church of Iraq preparing for the election of a new patriarch? What will the future have in store for you in light of the Synod and Benedict XVI'S Ecclesia in Medio oriente? We, clergy and faithful, are praying for a patriarch that is father and pastor to everyone, Christians and non Christians. We want a man who is open and ecumenical; someone who knows how to engage in dialogue, courageous and capable of doing the right thing, like liturgical, pastoral and spiritual reforms to train the clergy. We want someone who unites and does not divide; someone who brings together and does not drive apart; someone who knows the country's situation and politics in the centre and in Kurdistan, someone who is aware of the challenges. We want someone who will seek real solutions with all men of good will, someone who will work with other Middle Eastern Churches and fulfil the Apostolic Exhortation 'The Church in the Middle East: Communion and Witness' for a better future for all. The Holy See has a crucial role to play in all this, especially in ensuring that Christians can stay in their own country and keep their place. Card Leonardo Sandri's visit to Iraq and Egypt is part of this. As for us, we are waiting confident in the Holy Spirit. Chaldaean bishop: "We as builders of the new Iraq"
Mar Sako: the Pope in Iraq is a "necessity" for Christians hoping in a Syria-like "miracle"